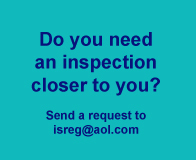 The stallion must obtain at least 220 points as an overall score at the initial ISR/OLD NA inspection. 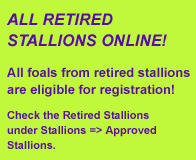 or the stallions must have participated in the National Young Horse Championship Finals as a four, five or six year old and achieved a placing of 1st - 8th place. three placings in the top three at recognized Three-Day events at intermediate/advanced level or higher. Minimum requirement is a number of 10 premium foals out of all foals by the stallion presented to the registry. 3 riding horses which are successful (placings 1 through 5) in classes above 4th level dressage or intermediate jumping or preliminary three day events. Imported stallions may get the fifth star award as well for successful offspring in their home country. Superior success in breeding competitions can be taken into consideration as well. In order to receive the star awards the owner of the stallion has to send an application form and all required documents to the ISR office. Nomination forms can be ordered at the office or can be downloaded under Services/Forms. The stallions are listed in order of the number and position of the stars.